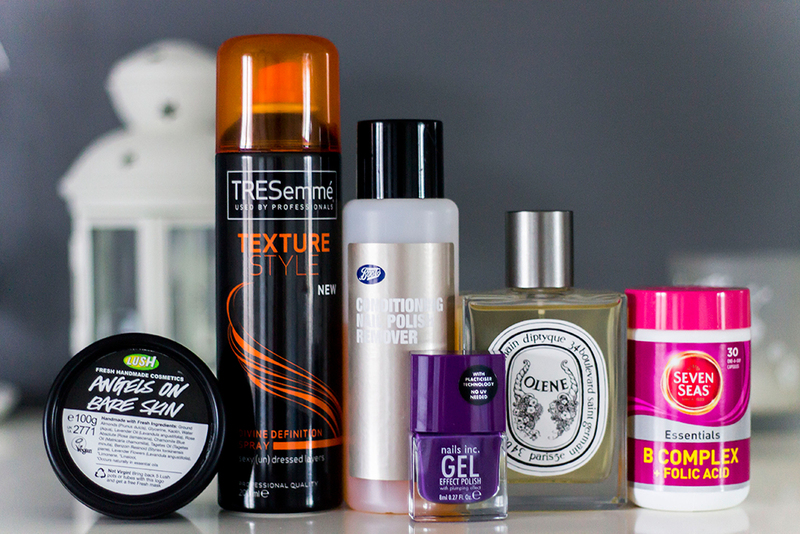 I can’t believe it’s time for January favourites already, where has this month gone? This month I haven’t changed up too much on the makeup front but all other areas have had a few new additions and old favourites appear again. It’s definitely been a month of sorting my skin out, volumised hair and going a bit nuts with nail polish. Here we go..
About 10 years ago was when I first used the Lush Angels On Bare Skin Cleanser*. Who knew I’d still be using it to this day? During the winter months, my skin has been really dry, particularly in the middle area of my face so I found using a gentle scrub really helps my makeup go on better. My skin is still a little problematic at the moment so I’m staying away from any normal face scrubs so using a cleanser with slightly more texture to it really helps. I still use the Lush Ultrabland Cleanser everyday but I use Angels On Bare Skin about once or twice a week to take care of any dry patches. I don’t use a ton of hair styling products but I always look for ones that won’t weigh my hair down and won’t ruin my hairstyle if I put a little too much on. My hair is quite long and layered so I’ve been loving the Tresemme Divine Definition Spray* to add a little more volume and definition. It’s such a lightweight spray that you can go crazy with it yet it never gives off that horrible too much hairspray texture to your hair. Once I dry my hair, I spray it into the layers and it makes such a difference. A few people have likened it to the Oribe Dry Texturising Spray but it’s definitely a much cheaper alternative. At first I didn’t have high expectations but the Nails Inc Gel Effect in Bond Street blew me away. I love the look of gel nails but as I change my nail polish shade every few days, it’s never really worth the hassle. This polish feels exactly like gel nails, has a gorgeous glossy finish and lasts so well on the nails. I have quite a few polishes to get through already but one day in the future I’ll definitely pick up more of the Gel Effects. Removing all the nail swatches from my Nails Inc posts would have been a nightmare without my trusty Boots Conditioning Nail Polish Remover. Using it with a single piece of cotton wool takes off all 10 fingers of polish, it’s amazing! It’s affordable, actually smells nice and keeps my nails strong in the process. I’d highly recommend it. One of my favourite scents is jasmine so when I found a perfume with a very real and fresh jasmine scent, I fell in love. I waited ages for the Diptyque Olene Perfume to drop in price in the Space NK sale and it’s safe to say I picked it up as quickly as possible. I won’t go into too much detail now but check back during the month of February for a full post on it. I’m one of those people who always gets ill, whether it be a cold or the flu so for the past few months I’ve been taking the Seven Seas B Complex + Folic Acid Vitamins. Since taking them I’ve felt like I have much more energy, I haven’t gotten ill and I’ve seen an improvement in my skin as it’s much less oily than before. Highly recommend these. The cheapest place to buy them is Feel Unique so I take advantage of the free delivery and buy in bulk every few months. I hope you enjoyed my January favourites, let me know what you’ve been loving this month. I love the shade of that polish, and am going to pick up the TresSemme.. thanks for sharing!